During the 2014 legislative session, Gov. Nathan Deal and the Georgia General Assembly appropriated funds for the statewide turfgrass facilities enhancement project. UGA has 22 scientists whose primary responsibilities are related to turfgrass and another eight faculty members who have some involvement in turf-related projects. They support the turfgrass industry by conducting research, educating industry professionals and training students who will become future industry leaders. The new Turfgrass Research Building in Griffin sits close to the campus’s turfgrass research plots. The building houses seven turfgrass scientists, their staff, postdoctoral research associates, visiting scientists and graduate students. The facility includes modern laboratories, offices, conference and classroom space and attached greenhouses. On the UGA campus in Tifton, old facilities have been replaced with new greenhouses and a headhouse facility to support UGA’s expanding warm-season turf breeding program. 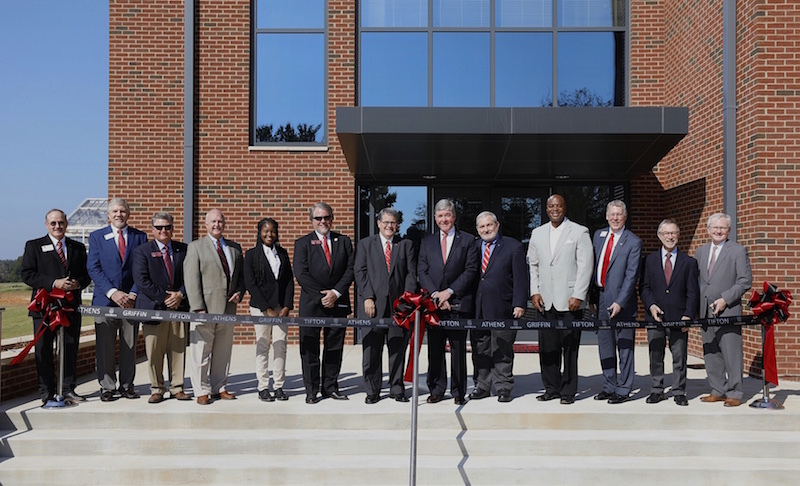 On the main UGA campus in Athens, scientists now have new greenhouses and a combination classroom and office complex to use for undergraduate teaching and research programs. “These world-class facilities will enhance UGA undergraduate and graduate education programs, enable our turfgrass scientists to conduct cutting-edge research, and enable the College of Agricultural and Environmental Sciences to retain and recruit the top turfgrass scientists necessary to ensure a prosperous future for the vital Georgia turfgrass industry,” said CAES Dean and Director Sam Pardue. UGA-bred turfgrasses cover lawns, championship golf courses, urban green spaces, and major and little league playing fields in Georgia, across the nation and around the world. Since 1990, the UGA Turf Team has generated close to $12 million in royalty income. Turfgrass is a $7.8 billion industry in Georgia, accounting for 87,000 jobs.